Recognizes the ~90 kDa (apparent MW) MDM2 protein in A549 cells. 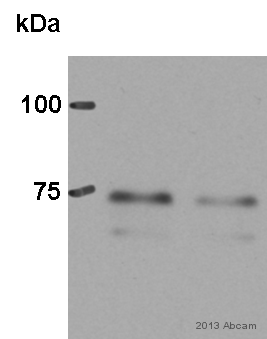 Full length protein corresponding to MDM2 aa 294-339. Shipped at 4°C. Store at 4°C (stable for up to 12 months). Do Not Freeze. Our Abpromise guarantee covers the use of ab16895 in the following tested applications. ICC/IF 1/200. Use paraformaldehyde fixed cells. WB Use a concentration of 2 µg/ml. Detects a band of approximately 90 kDa (predicted molecular weight: 55 kDa). Immunohistochemistry (Formalin/PFA-fixed paraffin-embedded sections) - Anti-MDM2 antibody [2A10] (ab16895)Image from Udeabor, Samuel Ebele et al. The Pan African Medical Journal 20 (2015): 140. doi:10.11604/pamj.2015.20. Fig 4. Immunohistochemistry (Formalin/PFA-fixed paraffin-embedded sections) analysis of ameloblastoma tissue sections labeling MDM2 with ab16895. The sections were de-paraffinized, hydrated and then rinsed in phosphate-buffered solution (PBS). They were immersed in heat-induced epitope retrieval citrate buffer of concentration 15mMol and pH 6.0, diluted 1/10 with distilled water and incubated at 95ºC for 10 minutes. They were then placed in fresh citrate, cooled in water for 20 minutes and then rinsed in PBS for 6 minutes. Peroxidase blocking reagent was added to each section for 5 minutes, and the sections were rinsed in 0.1% PBS for 6 minutes. The specimen were incubated for 30 minutes with 1/100 dilution of Anti-MDM2 antibody [2A10] (ab16895), then rinsed with PBS, followed by incubation with undiluted HRP for 20 minutes. 1ml of diaminobenzidine solution was added to cover the specimen, followed by incubation in a humidity chamber for 15 minutes. The sections were then immersed in aqueous haematoxylin and rinsed in distilled water for 5 minutes. The tissue was dehydrated and subsequently rinsed with xylene. Distyrene plasticizer in xylene mounting fluid was then applied, and a cover slip placed. Hematoxylin and eosin staining. ab16895 staining MDM2 in MCF7 cells treated with dienogest (ab141282), by ICC/IF. Decrease in MDM2 expression correlates with increased concentration of dienogest, as described in literature. The cells were incubated at 37°C for 24 hour in media containing different concentrations of ab141282 (dienogest) in DMSO, fixed with 4% formaldehyde for 10 minutes at room temperature and blocked with PBS containing 10% goat serum, 0.3 M glycine, 1% BSA and 0.1% tween for 2h at room temperature. Staining of the treated cells with ab16895 (5 μg/ml) was performed overnight at 4°C in PBS containing 1% BSA and 0.1% tween. A DyLight 488 anti-mouse polyclonal antibody (ab96879) at 1/250 dilution was used as the secondary antibody. Nuclei were counterstained with DAPI and are shown in blue. Overlay histogram showing HeLa cells stained with ab16895 (red line). The cells were fixed with 80% methanol (5 min) and then permeabilized with 0.1% PBS-Tween for 20 min. The cells were then incubated in 1x PBS / 10% normal goat serum (ab7481) / 0.3M glycine to block non-specific protein-protein interactions followed by the antibody (ab16895, 0.5µg/1x106 cells) for 30 min at 22ºC. The secondary antibody used was DyLight® 488 goat anti-mouse IgG (H+L) (ab96879) at 1/500 dilution for 30 min at 22ºC. 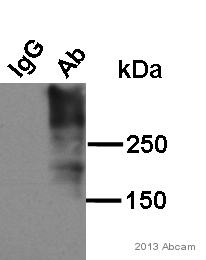 Isotype control antibody (black line) was mouse IgG2a [ICIGG2A] (ab91361, 1µg/1x106 cells) used under the same conditions. Acquisition of >5,000 events was performed. Immunohistochemistry (Formalin/PFA-fixed paraffin-embedded sections) - Anti-MDM2 antibody [2A10] (ab16895)Please note: for manual staining we recommend to optimize primary antibody concentration and incubation time (overnight incubation); amplification may be required. ab16895 staining Human normal tonsil. Staining is localised to nuclear + cytoplasmic compartments. Left panel: with primary antibody at 1 ug/ml. Right panel: isotype control. Sections were stained using an automated system DAKO Autostainer Plus, at RT: sections were rehydrated and antigen retrieved with the Dako 3 in 1 AR buffers citrate pH6.1 in a DAKO PT Link. Slides were peroxidase blocked in 3% H2O2 in methanol for 10 min. They were then blocked with Dako Protein block for 10 min (containing casein 0.25% in PBS) , incubated with primary antibody for 20 min and detected with Dako envision flex amplification kit for 30 min. Colorimetric detection was completed with DAB for 5 min. Slides were counterstained with Haematoxylin and coverslipped under DePeX. ab16895 staining MDM2 in MCF7 cells treated with progesterone (ab141252), by ICC/IF. Decrease in MDM2 expression correlates with increased concentration of progesterone, as described in literature. The cells were incubated at 37°C for 24 hour in media containing different concentrations of ab141252 (progesterone) in DMSO, fixed with 4% formaldehyde for 10 minutes at room temperature and blocked with PBS containing 10% goat serum, 0.3 M glycine, 1% BSA and 0.1% tween for 2h at room temperature. Staining of the treated cells with ab16895 (5 μg/ml) was performed overnight at 4°C in PBS containing 1% BSA and 0.1% tween. A DyLight 488 anti-mouse polyclonal antibody (ab96879) at 1/250 dilution was used as the secondary antibody. Nuclei were counterstained with DAPI and are shown in blue. ab16895 (1/200) staining MDM2 in assynchronous HeLa cells (green). Cells were fixed with paraformaldehyde, permeabilized with 0.5% Triton X100 and counterstained with DAPI in order to highlight the nucleus (red). Please refer to Abreview for further experimental details. Publishing research using ab16895? Please let us know so that we can cite the reference in this datasheet. Je ne pense pas que la bande à 45 kDa puisse correspondre à la forme non-modifiée de la Mdm2 humaine, isoforme de poids moléculaire 55kDa, http://www.uniprot.org/uniprot/Q00987. Dans ce cas la bande serait plus proche de 55 kDa que de 45 kDa. Je n'ai pas comparé l'épitope avec les isoformes d'autres espèces, supposant que vous travaillez avec des échantillons humains. Afin d'identifier la bande observée à 45 kDa je recommanderais d'effectuer une recherche sur le niveau d'expression des différents isoformes selon le tissu étudié ainsi que le degré de modifications post-translationelles. Je recommanderais également d'effectuer un contrôle négatif sans anticorps primaire afin de déterminer si la bande à 45 kDa ne correspond pas à un marquage non-spécifique du secondaire. Un changement d'agent bloquant peut également apporter plus d'information (lait à la place de BSA, ou l'inverse). I could like to test ab16895 for use in ChIP. Why is the observed molecular weight higher than the predicted 55 kDa? The increased molecular weight is likely due to ubiquitinization. According to the UniProt database (Q00987), MDM2 is auto-ubiquitinated; which leads to proteasomal degradation. It is also ubiquitinated by TRIM13. I am very pleased to hear you would like to accept our offer and test ab16895 in ChIP. This code will give you: 1 free primary antibody before the expiration date. To redeem this offer, please submit an Abreview for ChIP and include this code in the “Additional Comments” section so we know the Abreview is for this promotion. Please remember that submission of the Abreview is sufficient for the discount code to become active. A customer would like to know that whether ab16895 can recognize ab95934 (full length Human MDM2) by WB. If not, Would you please give some recommendation about the antibody which matchab95934? Thank you for your help! ab95934 is recombinant full length Human MDM2 Isoform 11. The difference between isoform 1 and isoform 11 is that isoform 11 has 6 more amino acid (VRSRQM) before a.a 2 -491 of isoform 1. As the epitope recognized by ab16895 is within a.a 294-339 of isoform 1 (according to the datasheet), ab16895 is therefore able to recognize ab95934. Thank you for contacting us. Here is the link to the Uniprot entry for the human Mdm2 protein: http://www.uniprot.org/uniprot/Q00987 I hope this information is helpful to you. Please do not hesitate to contact me if you need any more advice or information. Customer kindly asked if we can provide information about anti MDM2 antibodies. Thank you for contacting us. It was nice talking to you. As discussed please find attached all the information of anti MSDM2 antibodies in Excel format. I hope this information is helpful to you. Please do not hesitate to contact us if you need any more advice or information.